Saturday March 30, 2019, at 8 pm, $15. The seven-piece Mingus Appreciation Society brings together unique musicians and pays tribute to the quirky music of Charles Mingus. 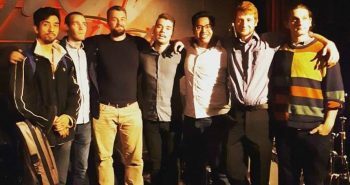 Jesse Malone trumpet; Robin Jessome trombone; Andriy Tykhonov piano; Tom AltobellI bass; Jordan Snider drums. 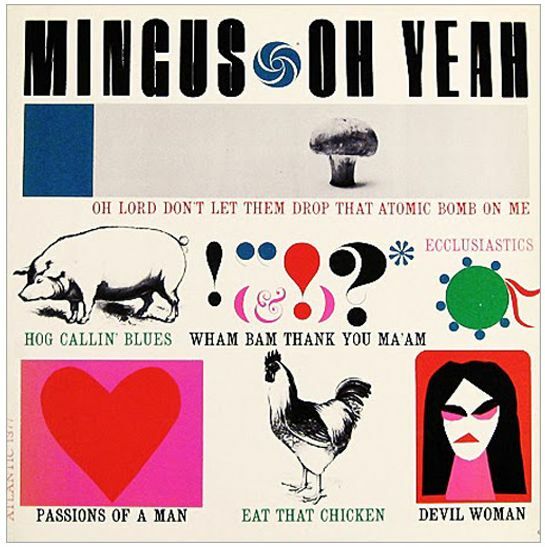 Weaving complex arrangements with group improvisation, the personality and sense of humour in Mingus’ timeless compositions reflect a man who was an eclectic and uncompromising musical force, and hugely influential on jazz musicians that followed him. 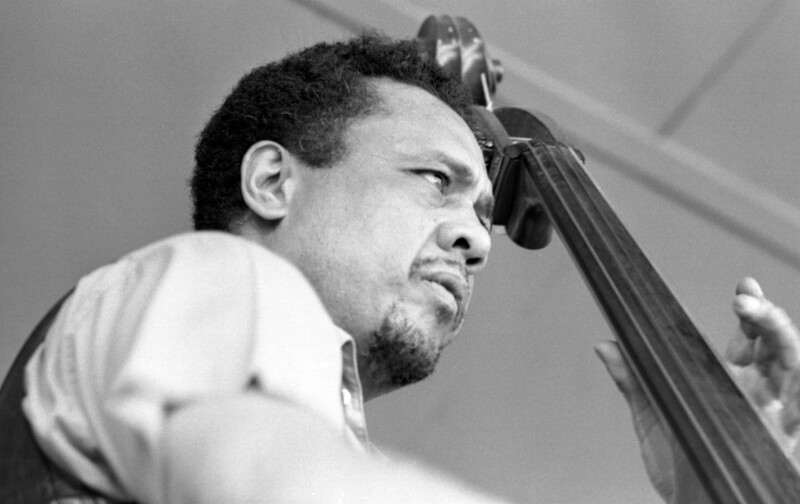 From Wikipedia: Charles Mingus Jr. (April 22, 1922 – January 5, 1979) was an American jazz double bassist, pianist, composer and bandleader. A major proponent of collective improvisation, he is considered to be one of the greatest jazz musicians and composers in history, with a career spanning three decades and collaborations with other jazz legends such as Louis Armstrong, Duke Ellington, Charlie Parker, Dizzy Gillespie, Dannie Richmond, and Herbie Hancock. Friday, March 29, 2019, at 8 pm, $10. An Artword favourite returns! Jazz with the Aubrey Wilson Quartet, featuring Chris Bruder on piano, Tom Altobelli on bass, Sean Bruce Parker on drums and bandleader Aubrey Wilson on vocals. Thursday March 28 2019, at 8 pm, $10. Join Emma Elena Grace, Shealagh Rose, and Rebekah Hawker, three rising singer-songwriters, for an intimate evening of stories and songs. 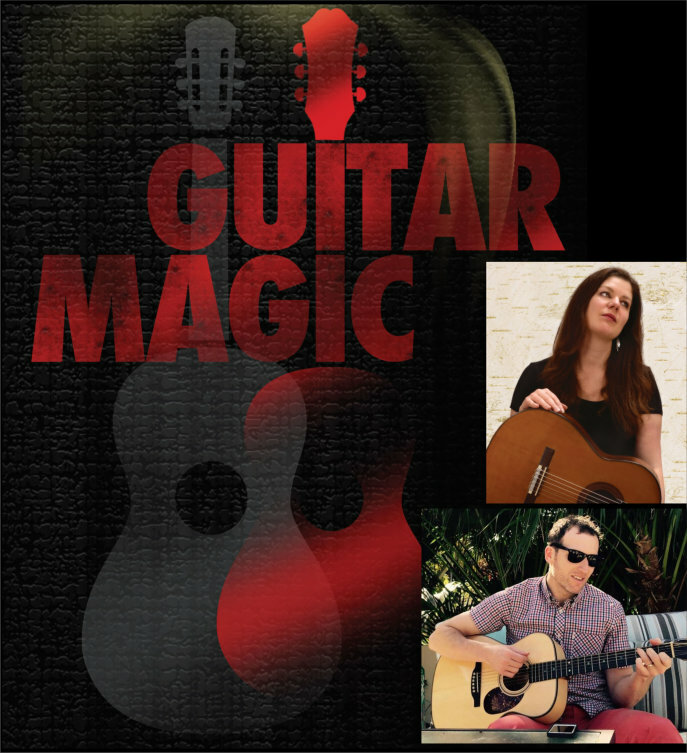 Saturday March 23, 2019, at 8 pm, $15/$10. Devin Patten is a Toronto-based jazz bassist and composer. 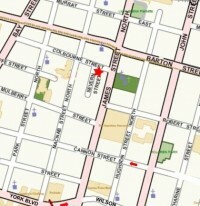 On this occasion at Artword Artbar, he will be leading a six-piece ensemble highlighting his original music. The ensemble: Brad Eaton trumpet, Kyle Tarder-Stoll tenor saxophone; Nebyu Yohannes trombone; Claire Lee piano; Devin Patten upright bass; Eric West drums. Devin’s compositions draw influence from the music of Wayne Shorter, Joe Henderson, Bill Evans and Claude Debussy. Devin was a regular performer at Artword during his student days at Mohawk College. He always had an ambitious musical project on the go. We are delighted to have him back! Friday March 22, 2019, at 8 pm, $15. 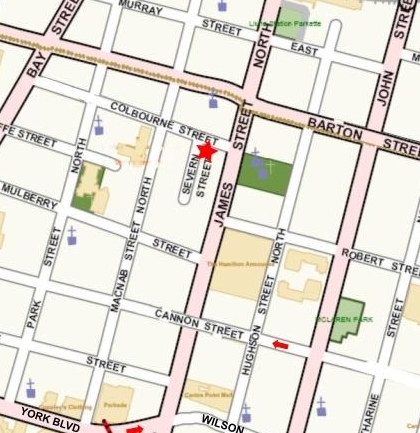 Artword Artbar is pleased to announce the return to Hamilton of noted jazz pianist and vocalist Paul Benton. 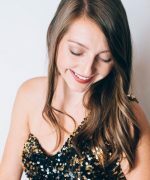 He celebrates his homecoming with a Swing Into Spring concert, a pianistic cocktail mixing original compositions and classic tunes, with vocals in four languages. 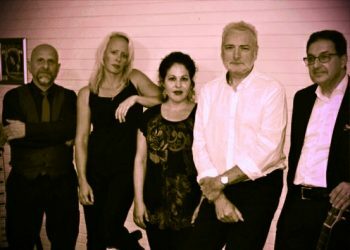 Paul Benton has been a professional musician for over 45 years, playing jazz, Latin and classical styles, and bringing fresh interpretations to the American Songbook. Based in Hamilton, he has performed in Europe and throughout North America. From 1988-1995, he and Roxanne Horbett-Benton, artist and designer, ran the Bay Area Jazz Society, producing festivals and a jazz magazine, The Riff. He has played Ontario Place, Roy Thompson Hall, Hamilton Place, Redeemer College, Hess Street Jazz Festival and Festival of Friends. For the last few years, he has been living in Victoria BC. Thursday March 21, 2019 at 8 pm, $15 at door/$10 advance. 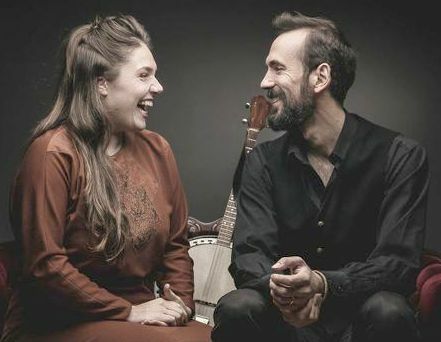 Acclaimed folk acts Tragedy Ann (Liv Cazzola and Braden Phelan) and Moonfruits (Alex Millaire and Kaitlin Milroy) bring us an intimate bilingual evening of laughs, reverie and vocal harmonies. 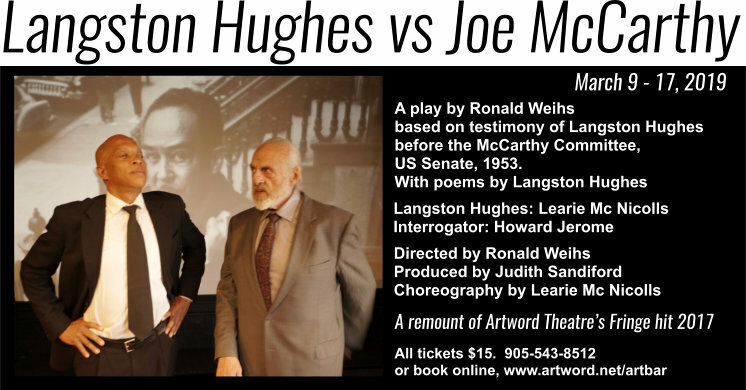 Artword Theatre is bringing back its timely and sensitive piece of documentary theatre, Langston Hughes vs. Joe McCarthy, written and directed by Ronald Weihs and produced by Judith Sandiford. Dancer-choreographer-actor Learie Mc Nicolls plays the role of Langston Hughes and character actor Howard Jerome plays The Interrogator. Is poetry subversive? U.S. Senator Joe McCarthy thought so. On March 24, 1953, Langston Hughes, renowned poet of the Harlem Renaissance, was summoned before the Senate Committee on Investigations. Did his poems contain communist ideas? In reply, Langston Hughes tells about his personal encounters with racism in America. The script is based on the actual transcript of his testimony, interwoven with the controversial poems, and incorporating dance, music and powerful images of the era. Saturday March 9 at 7:30 pm, OPENING Special, includes admission to the Beg To Differ concert, following at 9 pm. Sunday March 10 mat at 3:00 pm, Tuesday March 12 at 7:30 pm, Wednesday March 13 at 7:30 pm, Thursday March 14 at 7:30 pm, Friday March 15 at 7:30 pm, Saturday March 16 mat at 3:00 pm only, Sunday March 17 mat at 3:00 pm, final show. 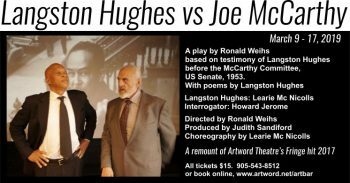 “Langston Hughes vs. Joe McCarthy,” playwright Ron Weihs’s probing drama, packs a lot of power into an hour. This short play, interspersed with elegant stage moves, as well as haunting poetry by the iconic Hughes, is a fusion of art forms that sits neatly on the Artword Artbar stage. The room is small. So is the stage. But the ideas are large. 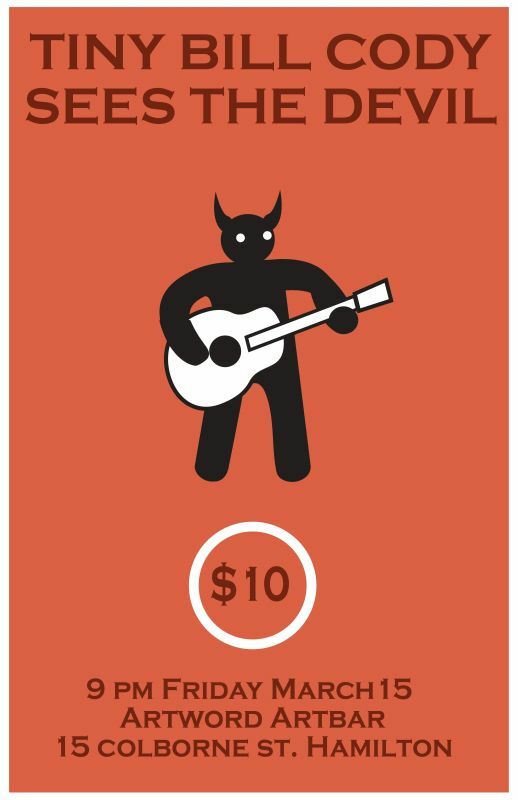 Friday March 15, 2019, at 9:00 pm, $10. Tiny Bill Cody Sees the Devil. (This is a late show after the 7:30 performance of Langston Hughes vs Joe McCarthy.) Call 905-543-8512. Tor Lukasik-Foss (aka Tiny Bill Cody) has been delivering off-kilter original songs in this city for two decades, and has recently cut his teeth as a storyteller with the Hamilton Seven. 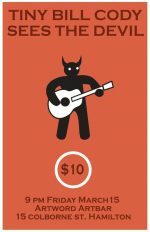 Join him as he presents Tiny Bill Cody Sees the Devil, an interconnected song and story cycle on hesitation, regret, social anxiety, and Satan! 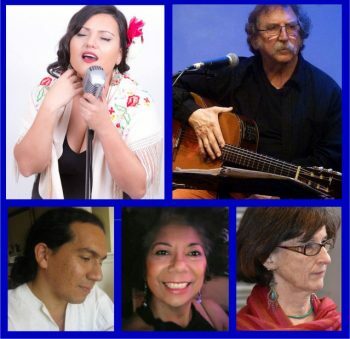 Thursday March 14, 2019, at 9:00 pm, $10 or by donation. (This is a late show after the 7:30 performance of Langston Hughes vs Joe McCarthy.) Call 905-543-8512. The Purple, White and Green: the story of the Scottish Suffragettes. Written to mark the 1918-2018 centenary of (some) women’s right to vote in the UK, this powerful piece of storytelling is both timely and compelling. 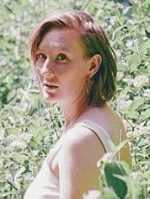 Storytellers Nicola Wright and Lea Taylor (from Edinburgh, Scotland) present with verve and vigour this mix of historical facts and prose, where deeds and words come together. 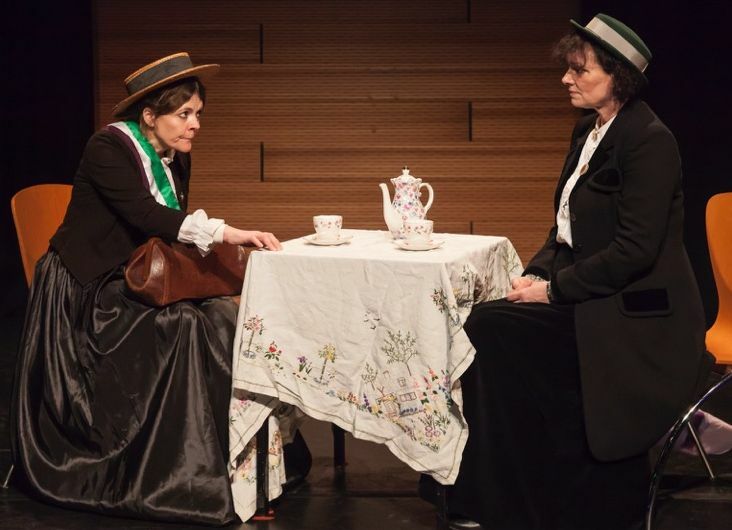 Nicola Wright and Lea Taylor performing The Purple, White and Green: the story of the Scottish Suffragettes. 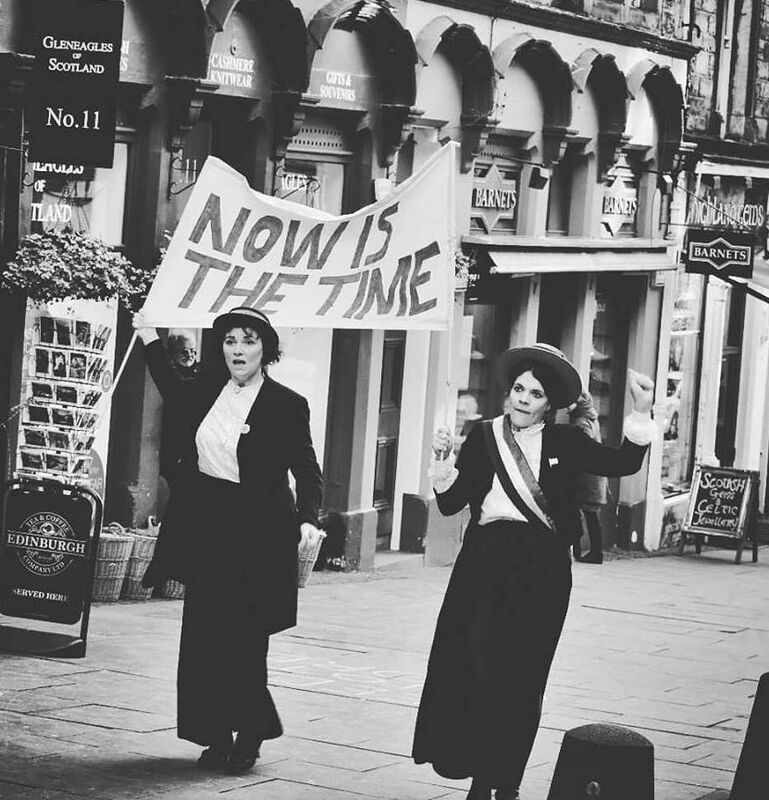 Photo left: performers Lea Taylor and Nicola Wright marching down the Royal Mile in Edinburgh, 2018. Their performance has enthralled audiences and even played at the Scottish Parliament before MSP’s and children. They will also be performing this show at the Toronto Storytelling Festival on or near International Women’s Day. 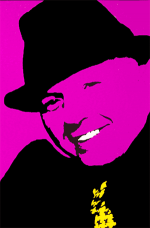 This show follows the performance of Langston Hughes vs Joe McCarthy from 7:30 to 8:30 pm. Friday March 8, 2019, at 8 pm, $15. A double bill of jazz and funk. Beelays: Jazz Quartet, with Jordan Snider on drums, Tom Altobelli on bass, Chris Bruder on piano and Scott McIntosh on guitar, is a stripped down instrumental edition of Hamilton’s hard-hitting funk rock band The Beelays. 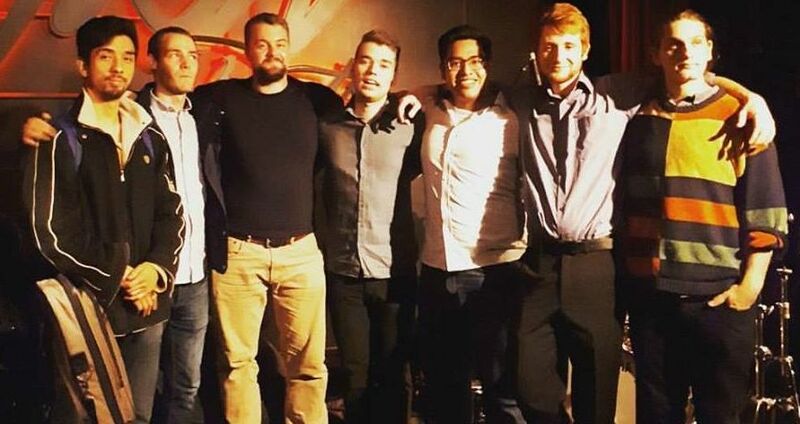 The quartet formed ten years ago while studying music at Mohawk College. 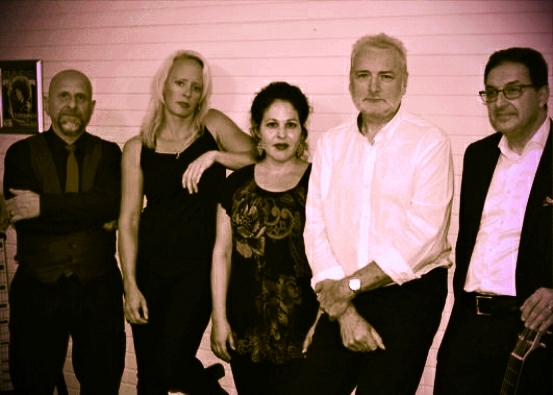 The quartet features compositions written by all members of the group that fuse elements of improvisation with the energy of live music to make a unique performance every time. 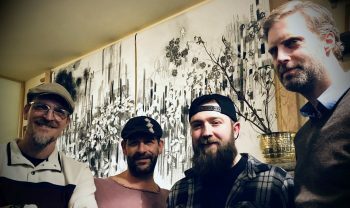 Nosey Neighbour, with Juno-nominated guitarist & bandleader Paul MacDougall, George Ouellette on bass and Costa Chatzis on drums, is a group based in Brantford, born from a shared love of jazz, fusion and funk. 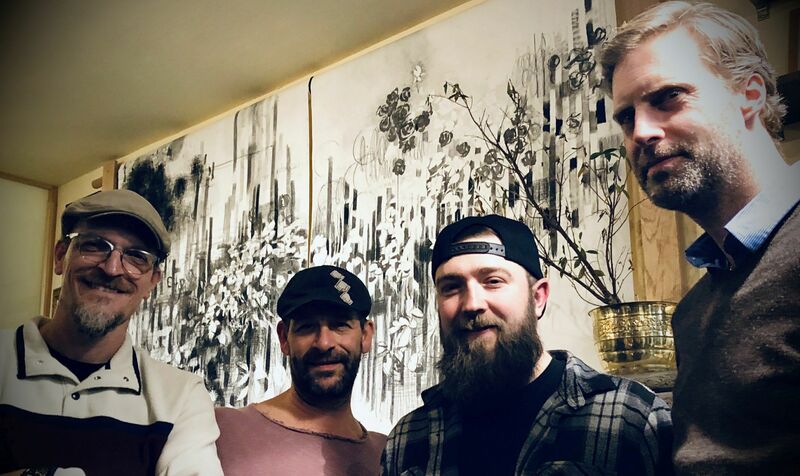 Nosey Neighbour‘s style fuses catchy heads and adept improvisation much like John Scofield, Medeski Martin & Wood, and Miles Davis. 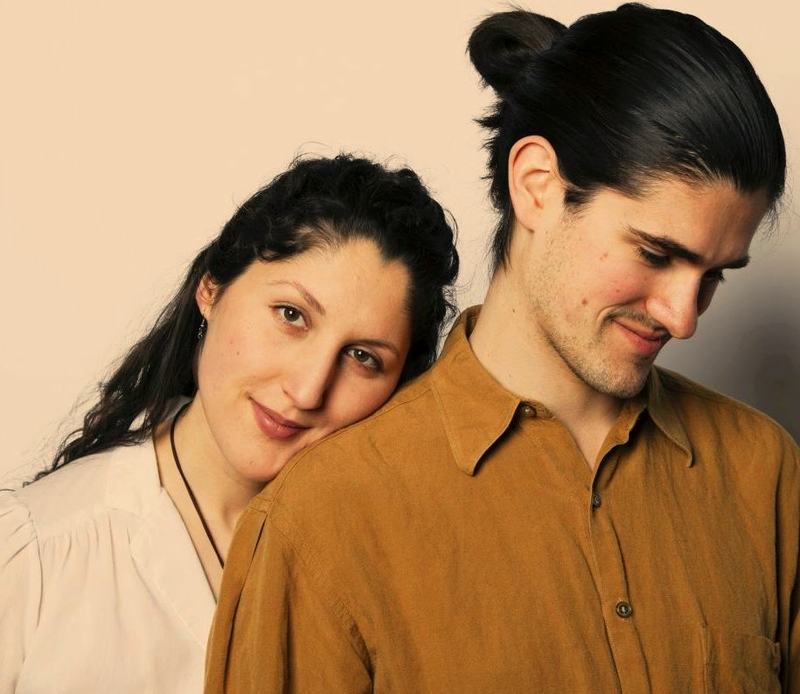 James Bryan is a member of the Philosopher Kings and duo Prozzak. Hamiltonians know Emma Rush as the force behind Guitar Hamilton. A must for all fans of the guitar. Event, Music, Music-Classical, Music-folk, Music-pop-etc. Wednesday March 6, 2019, at 8 pm. Admission by donation. The Sad Boys Literary Society returns with music, readings, and new chapbooks. Host Ben Robinson. Performers include: Elise Arsenault, Anthony Easton, Melissa Payne. NEW date: Tuesday March 5, 2019. Early! 7 to 9:30 pm. To reserve: call 905-543-8512. Jazz with The Jill McKenna Project: Jill McKenna bass, Adrean Farrugia piano, Mackenzie Read drums. 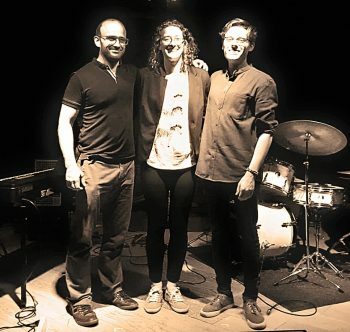 They will be exploring some new music and pushing the boundaries of what’s done in a normal jazz trio setting. Saturday March 2, 2019, at 8 pm, $10. 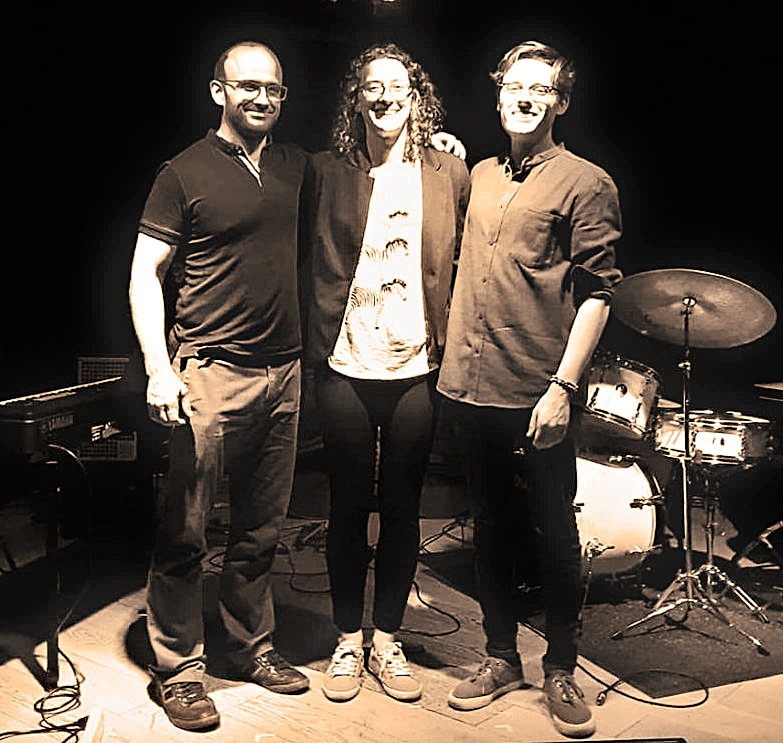 Artword welcomes back “sweet and soulful” jazz singer Carolyn Credico with the Carolyn Credico Quartet: Chris Bruder piano, Jordan Snider drums, Victor Vrankulj bass. 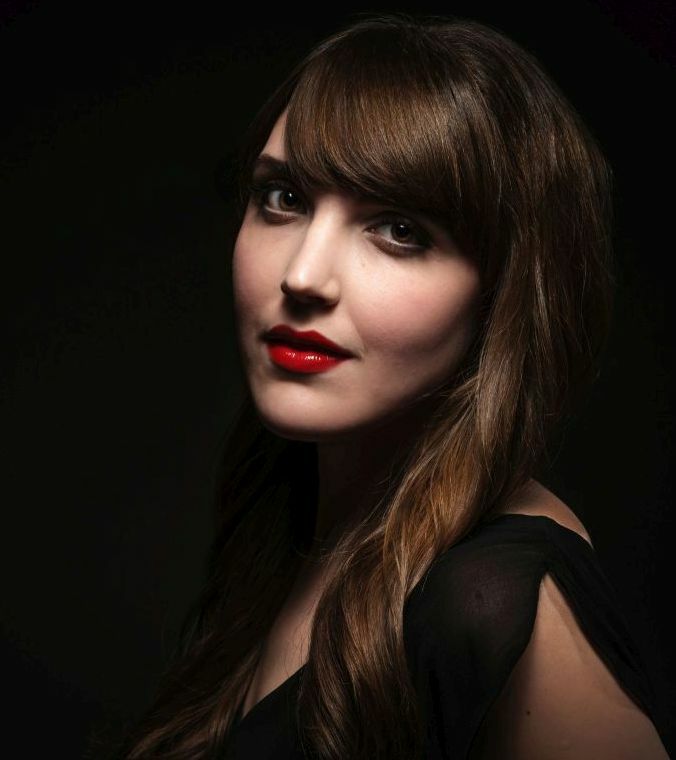 Join us for an evening of beautiful jazz standards. Special guest is Mike Malone on trumpet. Friday March 1, 2019, at 8 pm, $10. Online ticketing closed. Call 905-543-8512 or 905-912-9083 for ticket availability. 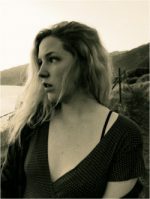 Amy Project returns to Artword Artbar! 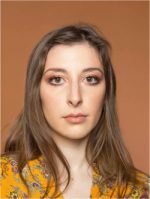 The show is a musical and storied journey outlining the short but tragic life of Amy Winehouse, the late British soul, blues and jazz singer. 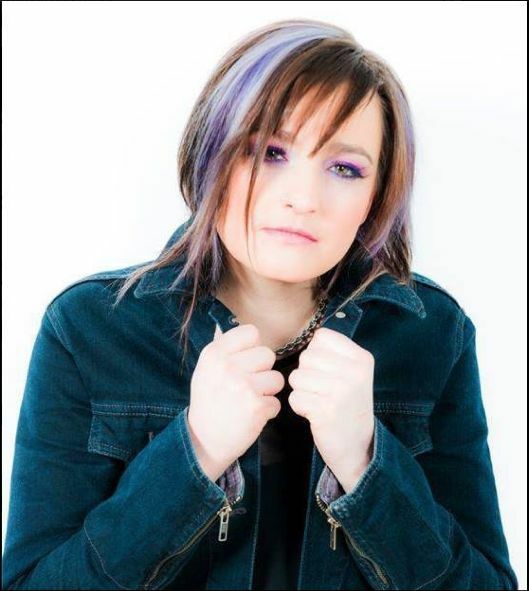 The performers are: Marni Shuster as the voice of Amy, Anthony Caradonna guitar/vocals, Ian Taylor bass/vocals, Amy DiNino piano/synth/vocals and Dominic DiNino drums. Amy Winehouse was nominated for 63 World Music Awards and won 25 times for her songs and recordings before her death in 2011 at the age of only 27. The Amy Project performance will cover most of the songs from her two main albums Frank and Back to Black, plus many more of her other recordings, and some unreleased covers and collaborations.